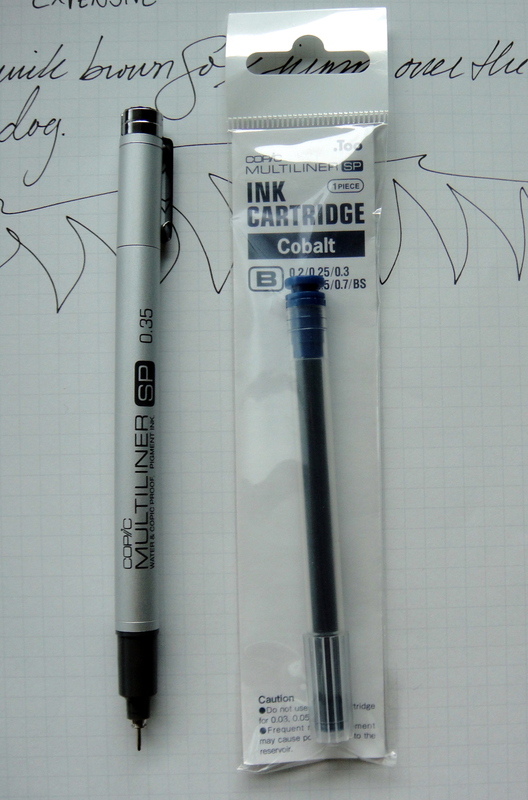 The Copic Multiliner SP is a drawing pen similar to the Staedtler Triplus Fineliner and the Sakura Pigma Micron. What makes the Multiliner special is that it has replaceable nibs and ink. 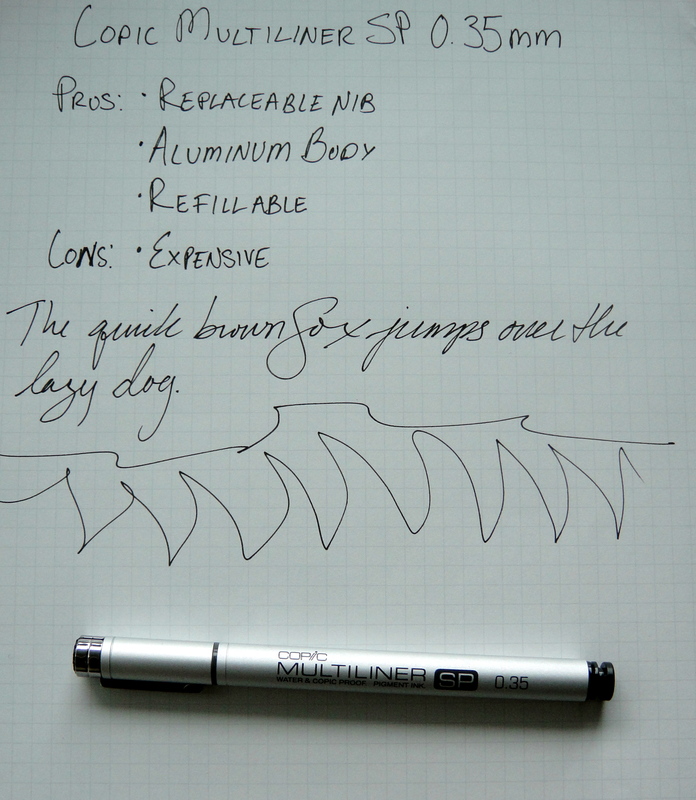 The Multiliner comes in 10 nib sizes and 13 colors (including black). It is worth noting that the black pen comes in all 10 nib sizes whiles the color Multiliners come in two. The color refills fit in the black pen so if you want a specific nib size you might be better off buying a black one and a color ink cartridge. The pen writes really well. The 0.35mm tip glides nicely across the paper and lays down a crisp black line. The tip does have some give but is not as soft as other fineliner type drawing pens. The body is aluminum and while it feels nice it has too much writing on the barrel for my taste. This pen was designed to be a tool and serves its purpose well. The pigment ink is waterproof. The Copic Multiliner retails for $9.20 and the ink refills cost $2.30; it’s not cheap (the refills are almost two times the price of the Staedtler) but the high quality writing experience is easily worth it. I was surprised by how much I like this pen. I prefer Multiliner to my now former favorite the Staedtler Triplus Fineliner. It is not anything like as scratchy as a Pigma Micron. I gave my old Pigma Micron pens to two new sketchers. But when they tried my Copic Multiliner, each of them wanted to go to the art shop immediately to buy one. I agree that the Copic is superior to the Pigma Micron; it’s a fantastic pen no question. I use these to draw with, along with the Pigma Micron, and similar pens to get the results I want. The main selling point is that these are among the pens used in drawing manga (Japanese comics). They are among the affordable means of producing line art -cheaper than a set of Koh-i-Noor Rapidographs and easier to use when a consistent superfine line is needed.